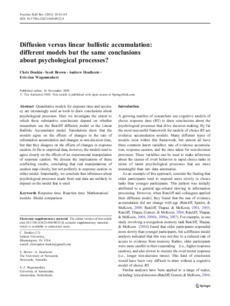 eCite - Diffusion versus linear ballistic accumulation: different models but the same conclusions about psychological processes? Copyright 2011 The Authors-This article is licensed under the terms of the Creative Commons Attribution Noncommercial License (CC BY-NC 2.0 AU) which permits any noncommercial use, distribution, and reproduction in any medium, provided the original author(s) and source are credited. Quantitative models for response time and accuracy are increasingly used as tools to draw conclusions about psychological processes. Here we investigate the extent to which these substantive conclusions depend on whether researchers use the Ratcliff diffusion model or the Linear Ballistic Accumulator model. Simulations show that the models agree on the effects of changes in the rate of information accumulation and changes in non-decision time, but that they disagree on the effects of changes in response caution. In fits to empirical data, however, the models tend to agree closely on the effects of an experimental manipulation of response caution. We discuss the implications of these conflicting results, concluding that real manipulations of caution map closely, but not perfectly to response caution in either model. Importantly, we conclude that inferences about psychological processes made from real data are unlikely to depend on the model that is used.